It is a Saturday morning. I am flying British Airways from Frankfurt to London at 7.15. After more than an hour flight I arrived: I do not land in Heathrow this time, but in the middle of the city, at City Airport. It is only 7.25 am because of the new time zone. 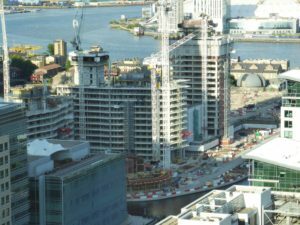 I do not have any luggage, so I walk out of the terminal, get onto the DLR (Docklands Light Railway) and another 10 minutes later I am in the Docklands at Canary Wharf, one of the development areas here in London. 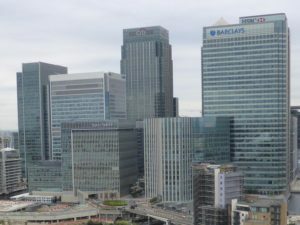 My gaze sweeps over the many well-known towers: I can see the One Canada Square tower with its pyramid shape, as well as high-rise buildings with the logos of HSBC, Citi, J.P. Morgan and Barclays. So far so good. Then I go to visit Paul. Paul is 35 years old, has lived in London for 7 years and works for investment bank, J.P. Morgan in Canary Wharf. He moved here a few months ago from an area 15 minutes away. I stand in front of his house and look up. There are 25 floors and it looks all new. I type his apartment number into the keypad. The Doorman greets me kindly and I take the elevator to one of the top floors. Paul opens the door with a warm smile and we hug: we’ve known each other for more than 10 years, when he was not even in London. I enter his designer apartment and look around. 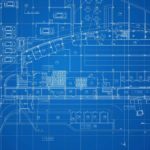 The place is full of Ikea – it works here as much as from a catalog and everything is brand new. I walk to the window front and look outside. Before me lies Canary Wharf – he has the perfect overview from here. 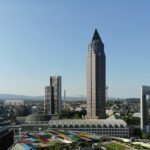 I am accustomed to high-rise buildings in Frankfurt and have always thought that it was doing quite well in Europe. 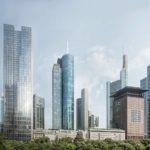 Now I realise how massive the buildings in Canary Wharf actually are: most of the office buildings have at least twice or even three-fold the depth of high-rise buildings in Germany. Here in the UK there are laxer working regulations: the depth of high buildings does not force a narrow cubature. Therefore, the buildings, which are close to each other, are not only impressive but somewhat threatening at the same time. An impression which should be strengthened later. Paul tells me he is now the owner of his apartment. Renting would be outrageously expensive: an apartment of this size would be around £3,000 of net rent per month, plus a service fee of £200 for the porter and gym. Then I look around the area and I notice one thing in particular: cranes. Everywhere, there are cranes. On the horizon, behind the highway, across the road, in every direction. London is booming, there is no doubt about that. Paul explains it to me. “What you see are residential towers going up everywhere. 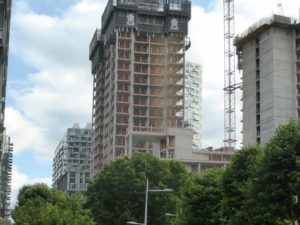 This is a new trend here in just the last few years.” Paul tells me that not even 500 meters away are eight residential buildings. All have at least 50 floors, some even scratch the 70th. “This is nothing.” he says to me and I begin to realise that London is very different from other cities. After some small talk we get on our way. Not ten minutes later we are in the middle of Canary Wharf, the established office area. From here, the city of London is around half a tube stop away. Between the concrete monsters (the building masses cannot be called densely close here) people disappear and look like tiny ants. I feel queasy and wonder why so many people work in this gloominess. We turn the corner and stand in front of the EMA building, which I did not know about until a few months ago; it has only became known to most people because of all the press since Brexit. 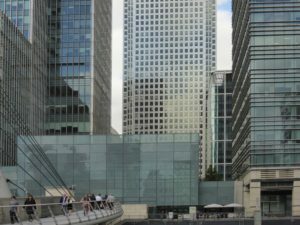 The EMA (European Medical Agency) is one of the European Union agencies, which, together with the EBA (European Banking Authority), will soon be leaving Canary Wharf and heading towards the mainland. My eyes glide to the right and suddenly I see only construction sites. Here a skyscraper, there a high-rise, here is simply built: “Again, all these skyscrapers will contain apartments.” I only think, “These towers are loosely 150 meters high, if not higher”. I’m taking photos, and I do not know what to shoot first. I start to count, but after some time I realise that it is almost impossible. 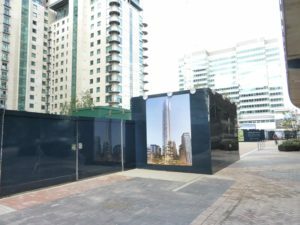 There must be dozens of residential buildings that have either just been completed or are being built, just at this small location next to Canary Wharf. “There is a lot of money in the market. Most of the apartments are sold to foreign investors“ says Paul. Not all apartments are occupied. Perhaps this is just a coincidence, or there are no tenants. Be that as it may, the building boom does not stop here. At least for the moment. 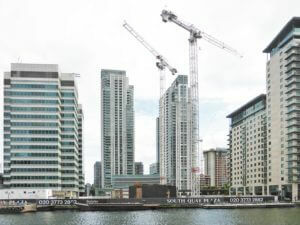 London is experiencing a construction boom at the moment. 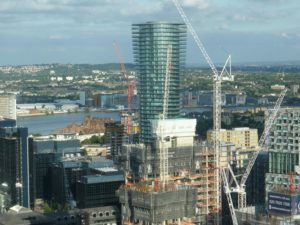 More than 150 high-rise buildings are under construction in the entire urban area. I want to know from Paul what he thinks of Brexit. Paul is a native Pole and his facial expression reveals everything: “I cannot believe it. Nobody here does. We are hoping that this is a big mistake and it can be reverted.” Paul explains he is very satisfied with his job in the American bank. He would be reluctant to leave. 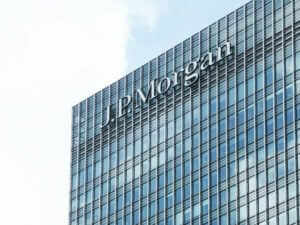 If J.P. Morgan would recommend him to another city, of course, he would consider it. Some of his colleagues from Europe have already said goodbye. 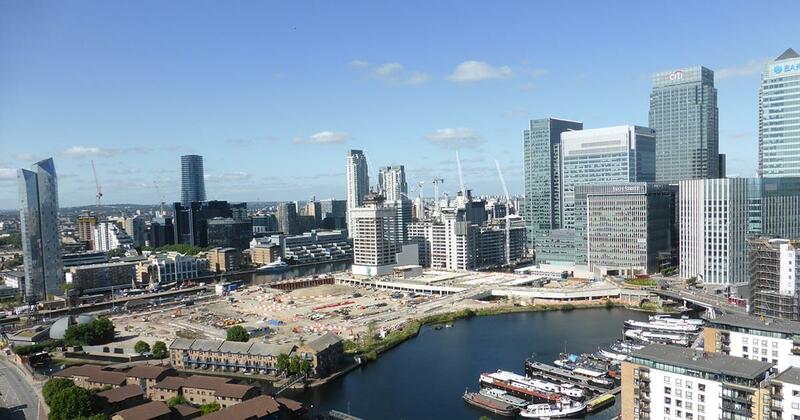 We continue through the Docklands and land in the chic, newly-opened Novotel Tower. We head to the 38th floor and the elevator doors open. The humming of decent Housemusik welcomes us and we enter the viewset with lounge character. Hipster, top-earners and tourists mix here. This does not feel like the xth bar, but here the stay is celebrated. We enter the roomy glass façades and look over the city. Cranes. Everywhere, cranes for new high-rise buildings. I take more photos. We want to sit down, but no table is free: “Sorry, all the tables are reserved.” Funny, because it is Saturday afternoon, just after 4 pm. We see a staircase, and stroll up it. Now the music sounds more electronic, but is still discreet. This is the well-designed restaurant area and here you feel immediately welcomed. A couple leave and we grab a table at the window. 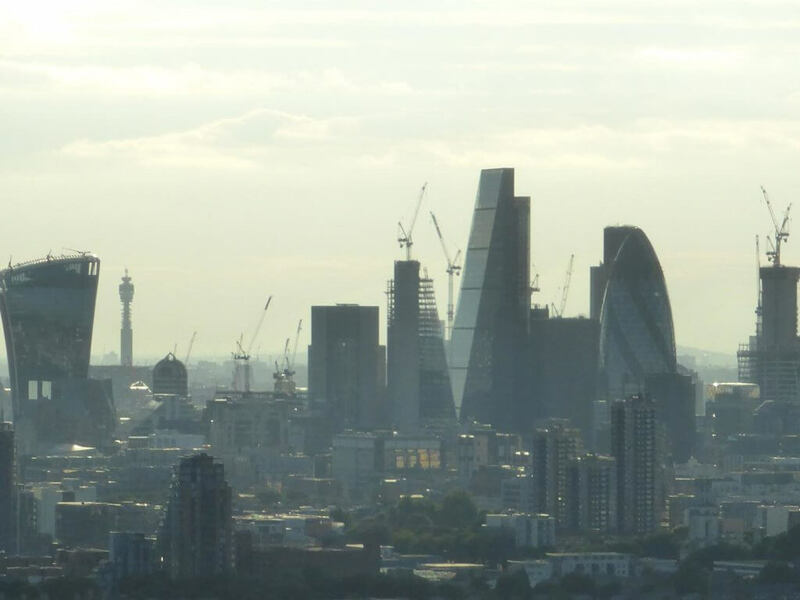 In the distance you can see the city, recognisable by its landmark buildings like the Shard or the Gherkin. Only now is the dime with me. London is not just a big city like Berlin or Madrid: London is the melting pot at present, a “place to be”. 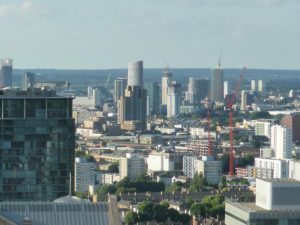 But the whole area of construction also has its shadows: I miss trees and nature in the cityscape of London, and I do not mean isolated trees here and there, but parks which are close to the centre, like in German cities. Then I think back to my hometown of Frankfurt and at that moment I am really looking forward to being back home soon. Our cities have a different quality of life, but are far more manageable.